Last week I had a big event to go to – excitement ensued as I had the perfect reason to go buy those strappy heeled sandals I’d had my eyes on for months (seriously, they are amazing!). I got myself all dolled up for the event – hair, a bit of makeup, accessories – squeezed into my dress, and popped my shoes on as I headed out the door. During the event one of my good friends commented on my shoes (of course she knew of the love affair that had occurred over several months) and I must admit, it made me feel a million bucks – until I looked down at them. Take a deep breath, the shoes were ok, but my feet weren’t! Dry, cracked and scaley, my feet looked like they belonged to a snake more than a human. I guess after a long, cold winter of being snuggled up in stockings and socks, I’d forgotten how to look after my feet and to provide that extra little bit of TLC. After I got over my mortification, I realised that some changes needed to happen in my life to avoid this embarrassment in future, particularly since the party season is fast approaching. Out came my home remedy – a foot bath and my trusty Detox Foot Scrub. The perfect pick me up for dry, cracked feet; the Detox Foot Scrub provides invigorating exfoliation and moisturisation in one! It’s thick consistency means it is a breeze to apply (no need to worry about it “sliding off” before you get a chance to start scrubbing) and the process only gets easier once you add water; as the scrub forms a rich, creamy lather that makes it effortless to spread across the entire foot. The natural foot scrub cares for your feet and treats cracked heels and calluses with the powerful exfoliation of Sea Salt. Add to this antibacterial and detoxifying benefits of Peppermint and Australian Lemon Scented Tea Tree Oil to get rid of any smelly odours and to keep any fungal infections at bay. So how to get feet feeling soft and smooth? Simply soak your feet in tepid water for 10-15 minutes to soften the skin. Apply a tablespoon of the Detox Foot Scrub to your foot and massage in circular motions. Simply rinse off, thoroughly dry your feet, and apply a deeply hydrating moisturiser/balm (such as Botáni Olivene Balm). Viola! In less than 30 minutes your feet are transformed. Pretty safe to say, the sandals are coming back out this weekend! To find out more about treating your feet to some TLC, check out our Happy Feet Program. Not sure how to give your feet a little extra care? Let me know your concerns below. P.S. – that’s the last of my blogs about preparing your skin for summer – I hope they have helped to reinvigorate your skin for the warmer weather! Next week I’ll begin the challenge of finding the perfect Christmas gifts for all my friends and family – one of the trickiest tasks for the year! 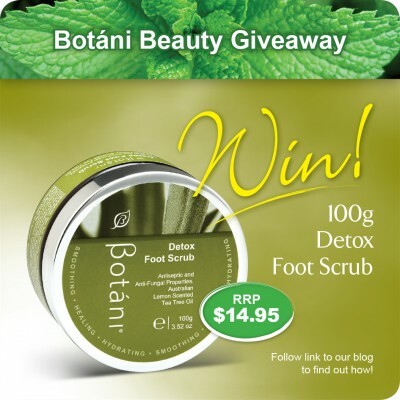 Want the chance to try Botáni’s Detox Foot Scrub? For your chance to win a Detox Foot Scrub 100g worth $14.95, simply ‘Like’ our Facebook page and ‘Share’ the post about this week’s blog with your friends. 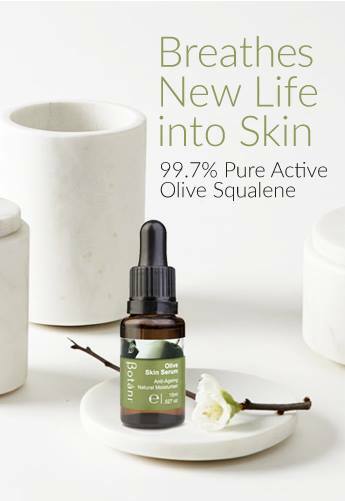 Getting healthier skin is that simple! *Competition is only open to Australian residents. Entries are open from October 28 – November 1, 2013. We will announce the winner by Facebook and on the blog on Friday 1st November 2013; the winner will also be contacted privately. 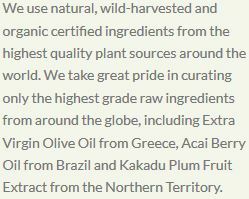 CONGRATULATIONS to Aimee Tatham who is this week’s Botani Beauty Giveaway winner!